People, I feel like we are getting close to a new ship announcement! I think we’re getting close to a lot of new ship announcements in fact! With the first of the new Disney Cruise ships sailing in 2021, there’s a chance we will see bookings open for that ship in the fall. Yes, THIS fall! My word, I feel like we have waited so long for this, and there are not enough exclamation marks in the world to show how excited I am. If bookings do open in the fall, or this time next year, Disney has a LOT of information to get out there before those bookings open. I think we’ll see names first, then details, then actual deck plans and room descriptions, followed of course by itineraries. 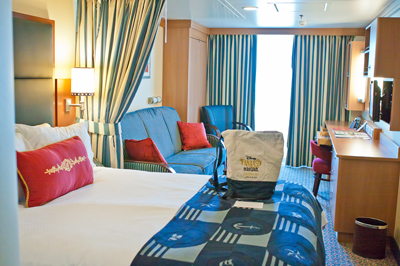 We can’t book staterooms without deck plans, room descriptions, and itineraries. 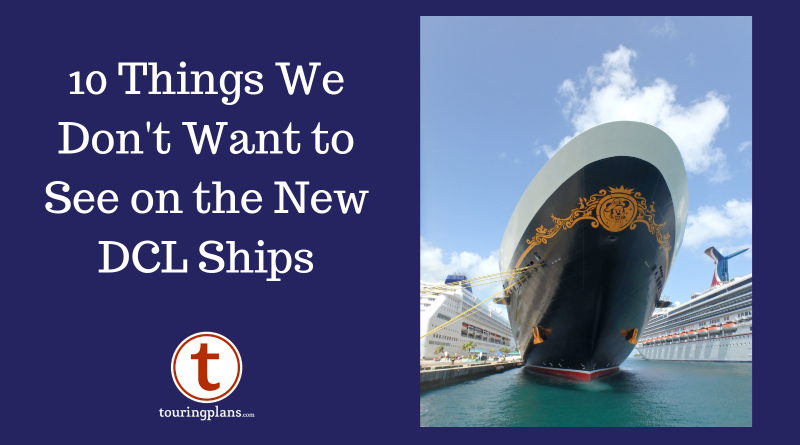 It’s going to be an exciting few months for Disney Cruise fans. 1. 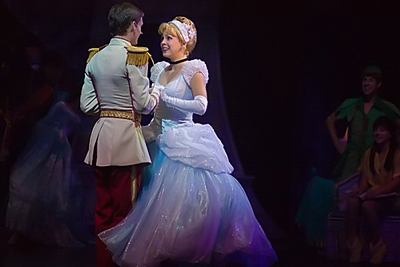 Smaller Staterooms – Disney’s standard staterooms are some of the biggest in the industry. Not big, mind you, but bigger. We do not want to lose that! I realize space is at a premium on a cruise ship, but stateroom size is space well invested in my opinion. In this case, bigger is better. 2. Fewer Bathtubs – While we are talking staterooms, I need to get one more plug in about the bathtubs. No other cruise lines have bathtubs as the standard. That’s a space thing. On other lines, you have to go up to a “suite” of some kind to get a bathtub. I don’t know why the trend of today has been to remove bathtubs from hotel rooms, but I hate this trend. Hate. Disney is for families. Families need bathtubs. Please don’t take them away. 3. Shopping Mall Entrance – I have thoroughly enjoyed some of the non-Disney cruises I’ve been on. What I did miss was the atrium. I love walking into the atrium on Disney’s ships. I love the chandeliers, the grand staircases, and the statues. They are welcoming, and make me feel like I am on a cruise ship. On some non-Disney ships I’ve been on, you basically are walking into a shopping mall. Don’t get me wrong, I love to shop, and I love shopping on a cruise. I just don’t want that to be the focus the second I walk on board. I hope Disney keeps their beautiful atrium on the new ships. 4. Repeat Shows – It may be too much to ask, but I’m hoping for ALL new shows. Currently, each ship has a signature show that’s only theirs, and some others that are performed on other ships. How awesome would it be to get multiple new shows? I love Disney’s nightly shows, and most of them are amazing. I am hoping they have some great ones in store, and don’t just recycle what they have. 5. 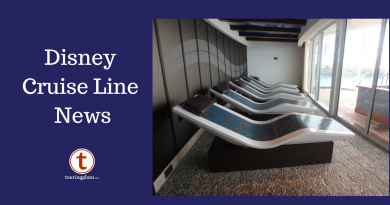 More Up-Charge Dining – I really, really hope we don’t see a lot of new up-charge dining introduced on these new ships! Let me clarify here, I don’t mind the two current up-charge restaurants on Disney ships, and I probably wouldn’t even mind a third option. The adult-only restaurants aren’t something you will want to do every day, and they are easy to pass on if you’re not interested at all. What I don’t want is a bunch more up-charge restaurants for all ages. It’s hard to pass by Johnny Rockets daily on Royal Caribbean ships–at some point, I have to give in. Come on, people. Milkshakes! Some other lines have also gone to up-charge food items in the main dining room (heresy) and/or a flat fee for room service. This is a disturbing trend that I hope Disney avoids. 6. More Up-Charge Activities Onboard – The more activities the better! Just please don’t make us pay for them. For example, the bumper cars on the new Norwegian ships look so fun. But again, I don’t want to have to pay for them. I don’t love the up-charge for sports simulators on the Dream and Fantasy, but at least they’re hidden! Those bumper cars are right out there for your kids to see every time they walk by. Impossible to resist! 7. Same Itineraries – While we know two of the three ships will land in Port Canaveral replacing the Dream and Fantasy, wouldn’t it be nice if one of the new ships goes somewhere new and exciting? I know why they want to put them in Port Canaveral, because they’re great itineraries for new cruisers, and obviously very popular. I’ve done those itineraries several times myself, but putting the new ships there will force me (and you) to repeat well-worn itineraries just to experience the new ships. So, let’s hope for somewhere new and exciting for the third. I mean, even if they base two in Port Canaveral and one in Miami, they could still do some long and different cruises from there. If we can’t get new home ports on a new ship, let’s at least get some new ports of call. 8. Higher Prices – For the love of all that is good and holy, let’s pray that the new ships don’t keep getting more and more expensive. (Aside from standard inflation, of course.) I guess if they do, hopefully we can at least look forward to cheaper prices on the Dream and Fantasy! When the Dream and Fantasy were launched, they knocked down prices on Florida itineraries on the Magic and Wonder, so let’s hope that the new ships do the same for the Dream and Fantasy! 9. Too Specific of a Theme – I made a plea for some themed rooms in my last blog post, but this time I would like to request that theming not go too far. I mean, Marvel rooms and Marvel-themed cruises would be amazing, but I want to avoid an entire Marvel-themed ship! 10. Casino – I think the odds that Disney will put a casino on their new ships are very, very small, but just in case someone gets a hairbrained idea, don’t do it! I realize that other cruise lines make a fortune on their casinos, but between the smoke and the age limits, it’s just not something a family-focused cruise line needs to do. How about you? Are you excited? Is there anything you’re worried about? Let me know in the comments. Tammy Whiting is the owner of Storybook Destinations. Did you know Storybook Destinations offers a complimentary subscription to TouringPlans with qualified Disney and Universal bookings? Click here for a no-obligation quote on your next vacation! I hope Disney is reading this! Especially #2, and for their hotels as well. Kids don’t like showers – we need a bathtub! One of the main reasons that I choose Disney over the other cruise lines is the fact that they DON’T have casinos. I LOVE the family friendliness of Disney and adding a casino seems like it would be step away from that. While I can appreciate that many like bathtubs, I like the option to choose a room without one as we don’t use it and the shower can be so much larger. I do like your list though, especially about pricing. Sadly we’ve been priced out of Disney Cruises for the past few years and I know we’re not alone. I do want to see more upcharge dining. More concierge level staterooms and concierge level categories, please. I’d like to see more interesting suites. Yes, please, to more itineraries. Just send a bigger ship to some place that’s not the Caribbean. Ooh, bigger Rainforest! That would be ideal. I also love the idea of more interesting suites! No higher prices – that’s not likely. The newer ships will be in higher demand – they are new. 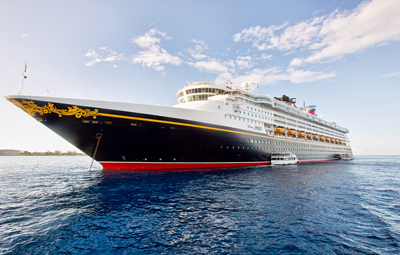 Law of supply and demand says Disney will be able to demand a premium for cruises on the new ships.